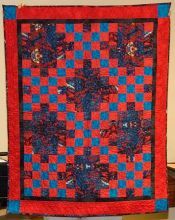 Anna Krassy is a very active member of Empire Quilters. At our meetings you will often find her helping to create some order out of our wonderfully chaotic share table. Anna has been sewing since she was in high school. The first machine she ever used was her mother's treadle machine. 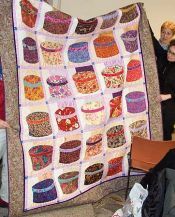 Anna's quilting career began in 1995 when she saw a handmade crocheted bedspread presented to one of her neices. What a great idea! — a handmade gift! 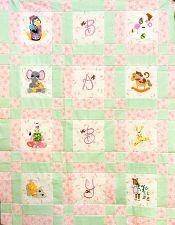 So she found a very thin how-to-quilt book at a fabric shop on Broadway below Canal Street, and she was off and running — making her very first basic four-patch baby quilt. 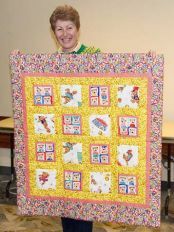 After making several four-patch quilts, Anna went in search of a class to help expand her knowledge and abilities. 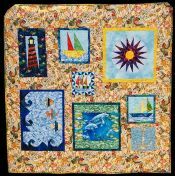 Like many of us, she happily discovered The City Quilter. 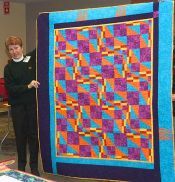 She took a sampler class, and in the class she learned that color choices were important (even in a sampler quilt! ), that there is more than one type of batting (who knew! ), and that a walking foot is very helpful if you want to machine quilt. 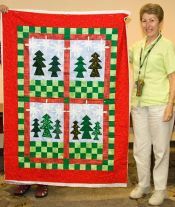 Great lessons we all need to learn in our quilting.